OUT of time and out of options Pioneer Valley mum Petrina Wust doesn't know what to do next. 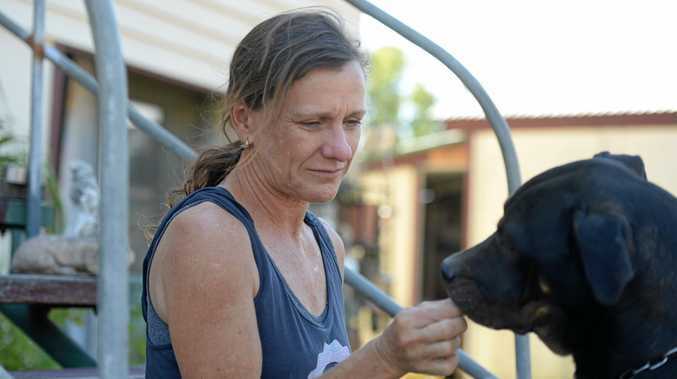 Distraught at the prospect of no longer having a roof over her head, Ms Wust reached out to the Daily Mercury in response to Tuesday's investigation into the rental market in Mackay. She spoke first-hand of the vulnerability low income earners face as the rental market tightens throughout the region. Yesterday, together with her 14-year-old son, she was legally required to vacate the Mia Mia rental property the two of them have lived in for the past 40 weeks. Running out of options, she said she couldn't even turn to emergency housing services because they were full. Ms Wurst said her landlords gave notice in July, requesting she vacate the property by Friday, September 21. The first notice was issued on 'no grounds' - a real estate term meaning that either party can end an agreement without giving a reason. After this, another notice to vacate was issued on September 4. The new notice requested Ms Wurst to leave the property by September 11 due to being behind in rent, something she disputes and has reported to relevant authorities. Unable to stay in their current home, Ms Wurst says she can't find another property she can afford. 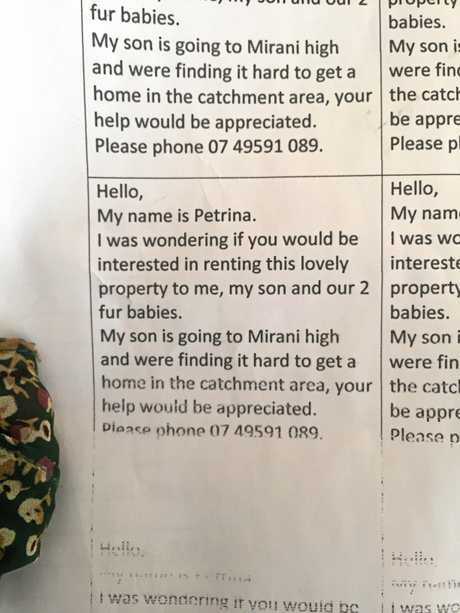 "I can't find anything in my price range within the high school catchment area for my 14-year-old son," she said. "It is just all very overwhelming. I just have run out of options. I do not know what to do." Unable to find a property in the price range she can afford, Ms Wurst has resorted to other methods to find a place for the family to live. "There [are] no houses around... I have even put notes on empty houses hoping someone will ring and let us live there," she said. Ms Wurst has resorted to leaving notes at vacant homes in an effort to find a home for her and her son. "I have run out of time and luck. I don't know what to do and all emergency accommodation is full. "Something needs to be done, the only option I can see for us is under the bridge." Sitting surrounded by her belongings which she has started to pack, Ms Wurst looks distraught. On top of this she is worried the instability her family is facing will give her son, who already dislikes school, the opportunity to quit. "My son despises high school... I can't afford to change his school at the moment and he has his friends out there," she said. "If it becomes difficult that is his chance to jump on the bandwagon and say 'Mum it is too difficult, I won't go to school'." Another factor working against Ms Wurst is the three dogs she took in as rescue dogs. The three dogs are classed as 'dangerous' breeds and she is worried they will be put down instead of being re-homed if she can only get a property that does not allow pets. As a single mother on a disability pension, Ms Wurst feels she has fallen through the cracks. Having lost her son's father to suicide four years ago she said both she and her son were working to improve their mental health. "I don't even get looked at [by real estate agents] they see a single mum, pension and I have a few mental health things," she said. "I need my son to be stable and the real estates as soon as they see I am a single mum on a pension they're gone." Ms Wurst said what the agents overlooked was that she has a regular weekly income through her pension payments. "I don't do the whole handout thing, I've never done it... this is the first time." Ms Wurst teared up as she said she was not looking for a home with any bells or whistles. "I need to get somewhere for my son," she said. "I am looking at dongas in the middle of a paddock, liveable sheds. As long as it has a toilet I can make it a home."